Sizing in the range 0.017 µm to 2 mm using a Coulter LS13320 laser diffraction particle size analyser using ISO13320 protocols. 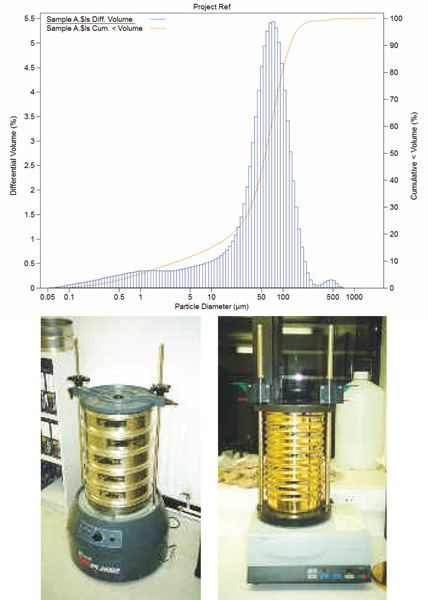 Samples are run in an aqueous solution (water or alcohol for sensitive materials), using large or small fluid modules (allowing samples as small as 0.001 g to be analysed). Dry and wet sieving in the range 63 µm to 63 cm, using British Standard or bespoke size intervals. If required, merging of laser diffraction and sieving data to produce a combined distribution, using BS1377, NMBAQC, BMAPA or other bespoke protcols. We are able to match a clients pre-existing sample preparation and reporting specification to ensure continuity of longer term datasets. Reporting in a wide variety of formats, including in-house GRADISTAT software, and classified in terms of our own classification scheme (Blott and Pye, 2012, see below), or historical schemes (such as the Folk scheme). For all enquiries, please contact us by email or on +44 (0)121 506 9067. As part of our strategic research we have developed a new particle size classification (PSC) and a new particle size distribution classification (PSDC, frequently referred to as 'texture') with new systems of nomenclature for each. 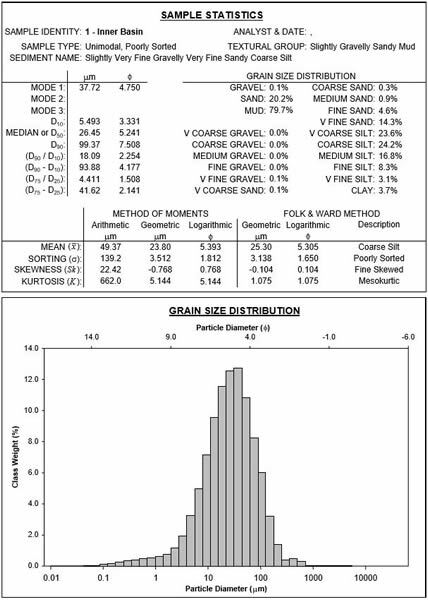 A computer program, in Microsoft Excel 2007/2010 format, is freely available which automatically classifies sediment or soil samples in terms of the percentages of gravel, sand and mud (GSM) or sand, silt and clay (SSC). Full details of the classification scheme are currently in press. © 2018 Kenneth Pye Associates Ltd. All rights reserved.